Read about how China has turned into an international education hub. Remember to share! KUALA LUMPUR: Taiwan has long been the destination of choice for Malaysian students from Chinese-medium schools looking to further their studies abroad. It has many attractions, among which are a conducive environment for educational pursuits and competitive fees. However, China is slowly but surely catching up with Taiwan as the education centre of the Orient. It is taking big strides in efforts to enrol students from all over the world. Taiwan, faced with a declining birth rate and brain drain, is welcoming Malaysian students with open arms. It even offers scholarships for undergraduate studies, master’s programmes and doctorate courses. Apart from exemption from paying tuition and miscellaneous fees, students also get monthly subsidies of NT$15,000 to N$20,000 (RM1,611 to RM2,148). But China is not content to be left behind. The Chinese government has undertaken many initiatives to place the country on the global education map. The country now boasts 2,409 colleges and universities. 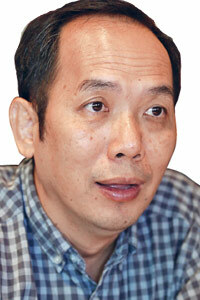 It invests about US$250 billion (RM807 billion) a year in human capital development, which includes education subsidies. In recent years, the country has managed to attract many Malaysian students, according to the United Chinese Schools Committees Association of Malaysia (Dong Zong). In 2011, a total of 4,338 Malaysians were studying in China. The following year, it surged 40% to 6,045. Last year, there were 6,126 Malaysian students in Chinese universities. 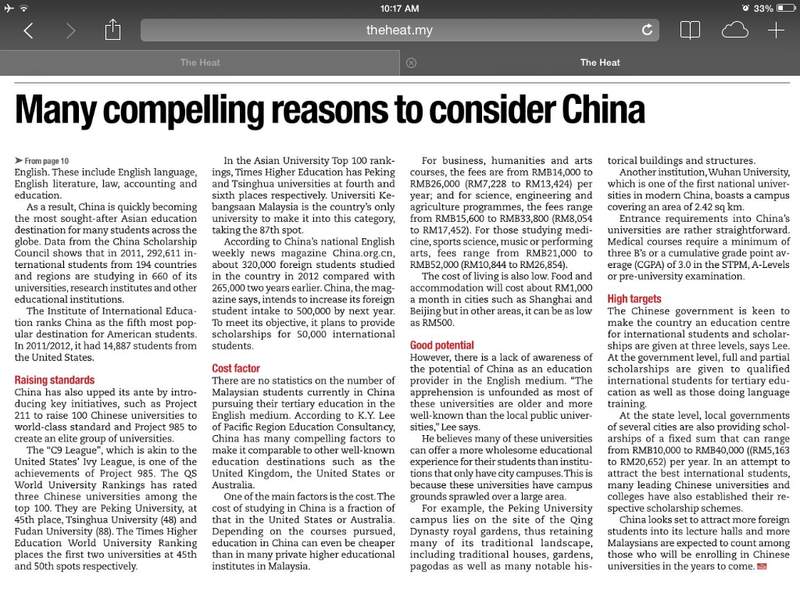 More Chinese universities are gaining recognition in Malaysia. The Malaysian Qualification Agency – the country’s accreditation body – has recognised 820 Chinese universities, thus ensuring all degrees from these varsities are accepted by the Malaysian government. The nation of one billion Chinese speakers is also breaking new ground by offering degree, master’s and doctorate programmes in the English language. According to the Chinese Education Ministry’s website, 34 universities now offer courses in English. These are mainly in science and IT-related subjects, but a few also offer business, humanities and art programmes in English. These include English language, English literature, law, accounting and education. As a result, China is quickly becoming the most sought-after Asian education destination for many students across the globe. Data from the China Scholarship Council shows that in 2011, 292,611 international students from 194 countries and regions are studying in 660 of its universities, research institutes and other educational institutions. The Institute of International Education ranks China as the fifth most popular destination for American students. In 2011/2012, it had 14,887 students from the United States. China has also upped its ante by introducing key initiatives, such as Project 211 to raise 100 Chinese universities to world-class standard and Project 985 to create an elite group of universities. The “C9 League”, which is akin to the United States’ Ivy League, is one of the achievements of Project 985. The QS World University Rankings has rated three Chinese universities among the top 100. They are Peking University, at 45th place, Tsinghua University (48) and Fudan University (88). The Times Higher Education World University Ranking places the first two universities at 45th and 50th spots respectively. In the Asian University Top 100 rankings, Times Higher Education has Peking and Tsinghua universities at fourth and sixth places respectively. Universiti Kebangsaan Malaysia is the country’s only university to make it into this category, taking the 87th spot. According to China’s national English weekly news magazine China.org.cn, about 320,000 foreign students studied in the country in 2012 compared with 265,000 two years earlier. China, the magazine says, intends to increase its foreign student intake to 500,000 by next year. To meet its objective, it plans to provide scholarships for 50,000 international students. There are no statistics on the number of Malaysian students currently in China pursuing their tertiary education in the English medium. According to K.Y. Lee of Pacific Region Education Consultancy, China has many compelling factors to make it comparable to other well-known education destinations such as the United Kingdom, the United States or Australia. One of the main factors is the cost. The cost of studying in China is a fraction of that in the United States or Australia. Depending on the courses pursued, education in China can even be cheaper than in many private higher educational institutes in Malaysia. For business, humanities and arts courses, the fees are from RMB14,000 to RMB26,000 (RM7,228 to RM13,424) per year; and for science, engineering and agriculture programmes, the fees range from RMB15,600 to RMB33,800 (RM8,054 to RM17,452). For those studying medicine, sports science, music or performing arts, fees range from RMB21,000 to RMB52,000 (RM10,844 to RM26,854). The cost of living is also low. Food and accommodation will cost about RM1,000 a month in cities such as Shanghai and Beijing but in other areas, it can be as low as RM500. However, there is a lack of awareness of the potential of China as an education provider in the English medium. “The apprehension is unfounded as most of these universities are older and more well-known than the local public universities,” Lee says. He believes many of these universities can offer a more wholesome educational experience for their students than institutions that only have city campuses. This is because these universities have campus grounds sprawled over a large area. For example, the Peking University campus lies on the site of the Qing Dynasty royal gardens, thus retaining many of its traditional landscape, including traditional houses, gardens, pagodas as well as many notable historical buildings and structures. Another institution, Wuhan University, which is one of the first national universities in modern China, boasts a campus covering an area of 2.42 sq km. Entrance requirements into China’s universities are rather straightforward. Medical courses require a minimum of three B’s or a cumulative grade point average (CGPA) of 3.0 in the STPM, A-Levels or pre-university examination. The Chinese government is keen to make the country an education centre for international students and scholarships are given at three levels, says Lee. At the government level, full and partial scholarships are given to qualified international students for tertiary education as well as those doing language training. At the state level, local governments of several cities are also providing scholarships of a fixed sum that can range from RMB10,000 to RMB40,000 ((RM5,163 to RM20,652) per year. In an attempt to attract the best international students, many leading Chinese universities and colleges have also established their respective scholarship schemes. China looks set to attract more foreign students into its lecture halls and more Malaysians are expected to count among those who will be enrolling in Chinese universities in the years to come. This article was first published in the June 7, 2014 issue of The Heat.